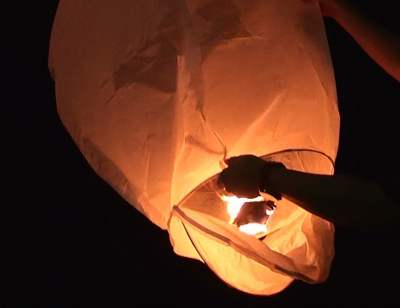 Covered Flame Sky Lanterns | SkyLanterns, Hanging Lanterns, CandleBags. Patent Pending Covered Flame Original Sky Lanterns Conceal the flame in case a gust of wind or something interferes with the normal flight of the lantern. Under reasonable conditions, these can land on thatched roofs, in wheat fields, or drop by plastic recycling plants and not cause fires. Although millions of lanterns (even low quality cube versions) are sold yearly, the incidents with them have been minimal. However, for peace of mind and for possible regulatory measures, we have created a lantern that does not have a naked flame. If you are concerned about safety and want to offer a lantern to please even the most safety conscious launcher, then this is the lantern for you. Chain stores removing lanterns due to safety issues, event & wedding planners, and those who just want the safest lanterns available, fear not. 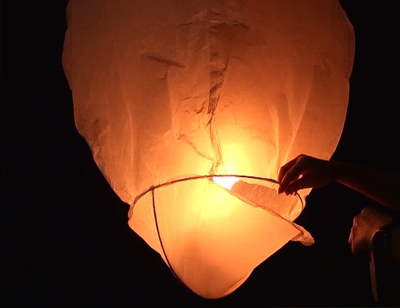 The second phase of the sky lantern Industry has started. The recent Smethwick blaze at the J&A Young plant, in Smethwick, West Midlands was a good thing for this industry. It has raised awareness which was crucial for the honest players in this industry. The days of cheap, dodgy sky lanterns are gone, (as these would never lift with the new bottom guard). 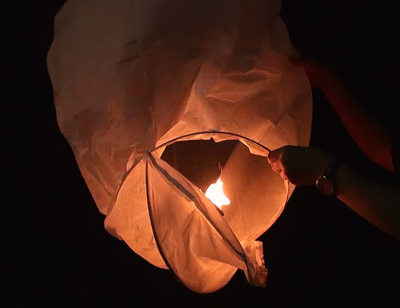 Reasonably price lanterns (less than a cup of coffee) will lead the next phase in the Sky lantern product life cycle. We are very excited about the future. Contact us for details!.